The Home Depot® Memorial Day Sale is one of the best times of the year to get everything you need for your yard and patio! Find deals on grills, flowers, mulch, appliances, and more! Today is the beginning of the best outdoor and home sales of the whole year- it’s time for the Home Depot Memorial Day Sale 2018!!! I love this almost as much as the Home Depot Black Friday Ad :) They always have amazing deals on grills, lawn care products, flowers and plants, patio furniture, and MORE! See the Home Depot® Memorial Day Sale Here! If you need mulch, they will have EarthGro Mulch 5 for $10! I always love their one day deals, so check in each day through Memorial Day! The ad also has a bunch of amazing prices on flowers! I grabbed some today and they had great stock at my store! There are so many awesome discounts on Grills! 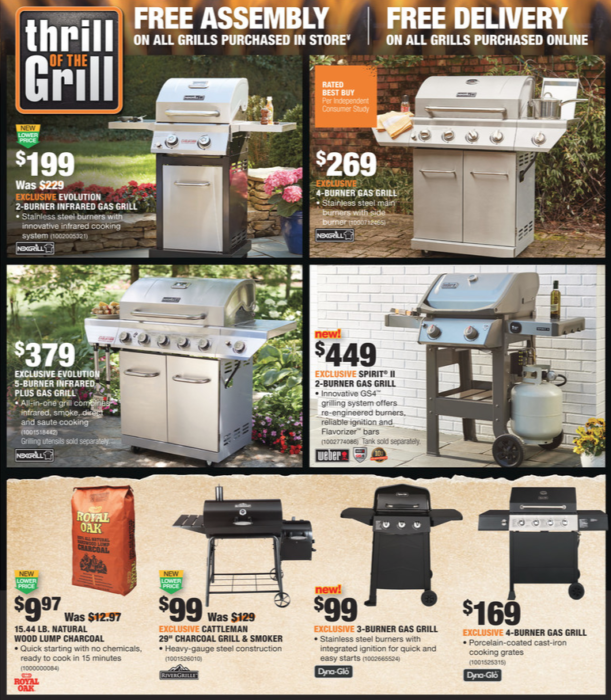 They have prices as low as $99 and other big discounts on larger grills! Take a look at all of the awesome deals in this year’s Home Depot Memorial Day Sale 2018 and get all that you need for your yard! Home Depot® is a trademark of Home Depot Product Authority, LLC. Contigo® Kids Water Bottles 2 Pack only $15.19! Payless Sandals as low as $5.24!